Two models including age, self-rated health (SRH) and prior sickness absence (SA) were found to predict high SA in health care workers. The present study externally validated these prediction models in a population of office workers and investigated the effect of adding gender as a predictor. SRH was assessed at baseline in a convenience sample of office workers. Age, gender and prior SA were retrieved from an occupational health service register. Two pre-defined prediction models were externally validated: a model identifying employees with high (i.e. ≥30) SA days and a model identifying employees with high (i.e. ≥3) SA episodes during 1-year follow-up. Calibration was investigated by plotting the predicted and observed probabilities and calculating the calibration slope. Discrimination was examined by receiver operating characteristic (ROC) analysis and the area under the ROC-curve (AUC). A total of 593 office workers had complete data and were eligible for analysis. Although the SA days model showed acceptable calibration (slope = 0.89), it poorly discriminated office workers with high SA days from those without high SA days (AUC = 0.65; 95% CI 0.58–0.71). The SA episodes model showed acceptable discrimination (AUC = 0.76, 95% CI 0.70–0.82) and calibration (slope = 0.96). The prognostic performance of the prediction models did not improve in the population of office workers after adding gender. The SA episodes model accurately predicted the risk of high SA episodes in office workers, but needs further multisite validation and requires a simpler presentation format before it can be used to select high-risk employees for interventions to prevent or reduce SA. Sickness absence (SA) is an indicator of the health status of working populations [1–4]. Long-term SA not only reflects poor health, but also excludes individuals from the labor market and restricts social participation. The chances of getting back to work decrease with increasing SA duration [5, 6]. Hence, it is of great importance to prevent long-term SA and pay attention to employees still at work, but at high risk of long-term SA. The importance of identifying employees at risk of long-term SA is further underlined by randomised-controlled trials showing that preventive consultations reduced the number of SA days in high-risk employees [7–9], but were not cost-effective in employees with moderate or low SA risks . Questionnaires have been developed to identify employees with a high SA risk [7–13]. However, questionnaire surveys often have moderate response rates and healthy employees are more likely to participate in surveys than employees with health problems, known as the ‘healthy volunteer effect’ [14–16]. Hence, employees at risk of SA may be missed in questionnaire surveys due to selective non-response . A prediction model or rule that includes readily available factors, would be practical for physicians to identify employees at risk of high SA. Although not all employees visit physicians or other health care providers, they will be more likely to be at risk of high SA than the ‘healthy volunteers’ participating in questionnaire surveys. Recently, two prediction models including age, prior SA and self-rated health (SRH) were developed in a sample of 535 health care workers . The SA days model ln(odds)SA = 0.601–0.016*age + 0.007*prior SA–0.718*SRH, fairly discriminated health care workers with high SA days from those with few SA days and showed acceptable calibration i.e., adequate agreement between predicted and observed probabilities of high SA days. The SA episodes model ln(odds)SA = 0.806–0.043*age + 0.472*prior SA–0.715*SRH showed good discrimination and calibration. Although both models were internally validated by bootstrapping techniques, they were not yet tested in another working population. Internally validated prediction models may degrade in other populations due to under- or overfitting [18, 19]. Underfitting occurs when important predictors of high SA are missing and overfitting occurs when a prediction model is too much adapted to the dataset in which it was developed. Hence, the ability of the SA prediction models to provide accurate predictions in other workers still needs to be addressed. McGinn et al. defined four levels of validation for prediction models. The fourth and lowest level is the development and internal validation of a prediction model. The third level represents validation in another small sample and the second level is reached by validation in large samples or multiple settings. The first and highest level is achieved when the use of a prediction model leads to a change in decision-making in medical practice and improvement of patients outcomes . How is the external predictive performance of the SA days model in office workers? How is the external predictive performance of the SA episodes model in office workers? The previous development setting was a female-dominated population of health care workers and, therefore, gender was discarded at the time of development. However, gender is an obvious characteristic to consider for the prediction of SA . Women are more frequently absent from work than men, possibly because of gender-related organizational and psychosocial work characteristics or gender differences in work-related factors interacting with person-related factors in family life . Therefore, the present study re-estimated the prediction models in office workers and evaluated the effect of adding gender. In November 2006, 1,137 office workers of an insurance company were invited to participate in an occupational health check-up. The health check-up questionnaire assessed general health, mental health, work conditions, and the working environment. General health was investigated with the question: In general, how would you rate your health? This question has been used as a health measure in surveys worldwide and was found to be associated with various morbidity measures and the use of health services . For SRH, office workers rated their health in categories 4 = “excellent”, 3 = “good”, 2 = “fair” and 1 = “poor”. The Medical Ethics Committee of the University Medical Center Groningen granted ethical clearance for linking the health check-up data to the SA data. Sickness absence (SA) was defined as absence from work due to work-related and non work-related injuries or illnesses. SA data were retrieved from an occupational health service register that records SA from the day of reporting sick to the day an employee resumed work at equal earnings as before SA. The calendar days between the first and last SA day were accumulated. For example, if a worker is off work 1 day on one occasion and 5 days on another, this was counted as 6 SA days and 2 SA episodes, unless the episodes were less than 28 days apart. In line with Dutch SA insurance policies, SA episodes with less than 28 days worked between them were regarded as one SA episode. The total number of SA days in 2005 and 2006 was tallied for each employee as a measure for prior SA in the SA days model. Likewise, the total number of SA episodes in 2005 and 2006 was accumulated for each employee as a measure for prior SA in the SA episodes model. The number of SA days and episodes were also recorded for each employee during 1-year follow-up in 2007. At the development of the prediction models, high SA days was defined as ≥30 accumulated (not necessarily consecutive) SA days and high SA episodes as ≥3 episodes during 1-year follow-up . The same definitions for high SA were adopted in the current external validation study. The original prediction models were applied in the external dataset with fixed regression coefficients i.e., by transporting the regression coefficients from the development setting to the validation setting. The external validity of predictions was quantified by performance measures related to discrimination and calibration [24–26]. Discrimination was evaluated by the area under the receiver operating characteristic curve (AUC). An AUC of 0.5 indicates no discrimination above chance and an AUC of 1.0 indicates perfect discrimination. Generally, an AUC = 0.9-1.0 represents excellent, AUC = 0.8-0.9 good, AUC = 0.7-0.8 fair, and AUC = 0.6-0.7 poor discriminative ability. Discrimination is assumed to be useful if AUC ≥0.75 . The prognostic validity of the prediction models was investigated in more detail by calculating the sensitivity and specificity at different cut-off points of predicted high SA probabilities. Calibration was assessed by plotting predicted probabilities with fixed regression coefficients obtained from the development setting of health care workers against the observed probabilities in the population of office workers [24–26]. Calibration was expressed in the calibration slope with a calibration slope = 1 indicating perfect calibration. The aforementioned external validation kept the regression coefficients fixed at their original value obtained from the development setting. Updating was performed by model revision, which is the re-estimation of the regression coefficients of predictor variables and/or considering more covariates for inclusion in the model [25, 26, 28]. First, the regression coefficients of the prediction models were re-estimated for the population of office workers. After re-estimation of the regression coefficients, gender was added as a predictor to the prediction models. The effect of including gender was assessed by using the Likelihood Ratio (LR) test and significance was concluded for LR p < 0.05. Furthermore, we evaluated the effect of excluding SRH from the prediction models, since SRH is not usually recorded in SA registers. The effect of excluding SRH was also assessed by LR testing. External validation was performed in R (R Development Core Team, 2009) using Harrell’s Regression Modeling Strategies (rms) package, version 3.2-0 . A total of 633 office workers (56%) participated in the health check-ups. Participants had a mean age of 44.5 (standard deviation [SD] = 9.3) years and non-participants 39.0 (SD = 9.4) years (t-test for independent samples p < 0.01). Of the participants, 62% were men as compared to 68% of non-participants (Chi-square p = 0.04). Participants had fewer SA episodes (Chi-square p < 0.01) than non-participants; 15% of participants had high SA episodes as compared to 22% of non-participants (Chi-square p < 0.01). Categories of SA days (Chi-square p = 0.16) and the proportions of high SA days (Chi-square p = 0.45) did not differ between participants and non-participants. Among participants, the response on SRH was missing in 5 cases and SA data were missing in the occupational health service register in another 35 cases. These 40 workers (6%) with missing data were excluded from analysis. Hence, the study population for external validation consisted of 593 office workers with complete data (Table 1). A total of 66 (11%) office workers had high SA days and 67 (11%) office workers had high SA episodes during follow-up; 29 office workers had both high SA days and episodes. Figure 1 shows the receiver operating characteristic curves, which reflected a poor discriminative ability of the SA days model (AUC = 0.65; 95% CI = 0.58 – 0.71) and a fair discriminative ability of the SA episodes model (AUC = 0.76; 95% CI = 0.70 – 0.82). The sensitivity and specificity at different cut off points for the probability of high SA episodes are shown in Table 2. Discriminative ability at external validation. The figure shows the ROC curves of the models identifying office workers with high sickness absence days (grey line; AUC = 0.65 with 95% CI = 0.58 – 0.71) and high sickness absence episodes (black line; AUC = 0.76 with 95% CI = 0.70 – 0.82); the diagonal indicates no discrimination above chance. 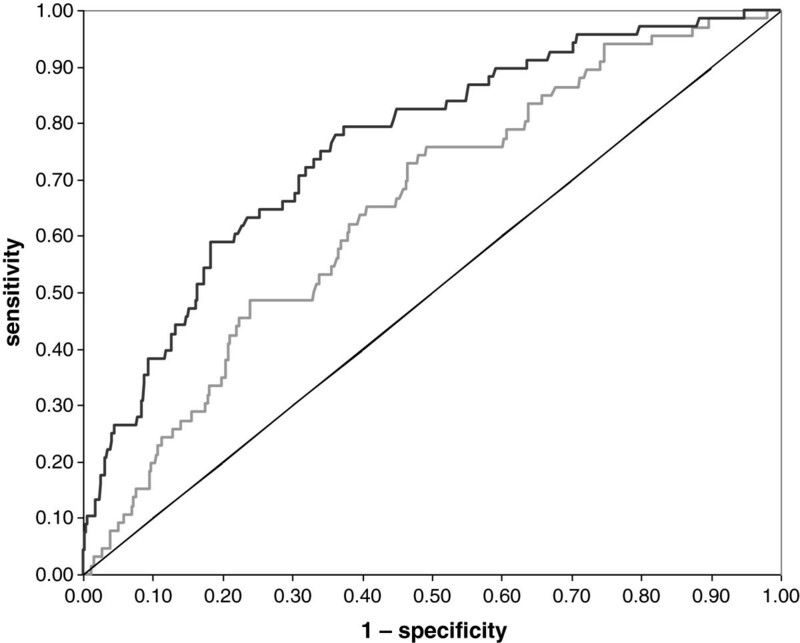 a sensitivity; b specificity; c positive predictive value; d negative predictive value. The table shows the prognostic characteristics for each cut-off SA probability of the model identifying office workers (N = 593) with high SA episodes at external validation with fixed coefficients. Calibration was acceptable for both prediction models, as is shown in the calibration plot (Figure 2) with calibration slopes of 0.89 for the SA days model and 0.96 for the SA episodes model. Calibration plot. The figure shows probabilities of high SA predicted by the SA days model (grey dots) and the SA episodes model (black dots) with fixed regression coefficients from the development setting, and the observed probabilities of high SA in office workers per quintile of predicted probabilities; the diagonal indicates perfect calibration. Re-estimation of the regression coefficients of the SA days model showed that the regression coefficients of prior SA days and SRH in office workers were half the values of the development sample. The SA days model improved after gender was added (LR-test p < 0.01), but its predictive performance was similar to that of the SA days model without gender (Table 3). The SA days model significantly degraded (LR-test p = 0.04) when SRH was excluded. a standard error; barea under the receiver operating characteristic curve. The table shows the regression coefficients and performance measures in a development sample of 535 health care workers and the current validation sample of 593 office workers. With regard to the SA episodes model, the re-estimated regression coefficient of SRH was reduced from −0.715 at the development setting to −0.190 at the current validation setting. The SA episodes model neither improved after adding gender (LR-test p = 0.11), nor degraded after excluding SRH (LR-test p = 0.31). The SA days model poorly discriminated between office workers with and without high SA days, whereas the SA episodes model showed fair discrimination and acceptable calibration. Although gender was associated with SA, particularly SA days, the predictive performance of the models did not improve after adding gender. It would have been interesting to add other readily available work-related or person-related variables from the health check-up, but the number of high SA events restricted the number of predictors in the SA prediction models. Generally, it is advised to include one predictor per 15 or more events . With an effective sample size of 66 employees with high SA days and 67 employees with high SA episodes, the prediction models could only include four predictors in the present validation setting. Although SRH is easy to obtain without the need for questionnaire surveys, employees have to be asked to rate their health. Thus, SRH can only be gathered at worksite health fairs or from employee visits to health care departments. Our study showed that the predictive performance of the SA episodes model was maintained after deleting SRH from the prediction model. This implicates that age and prior SA, which are regular SA register data, would suffice to identify white collar worker at risk of high SA episodes. However, it should be noted that SRH was a stronger predictor in the health care setting where the prediction models were developed. 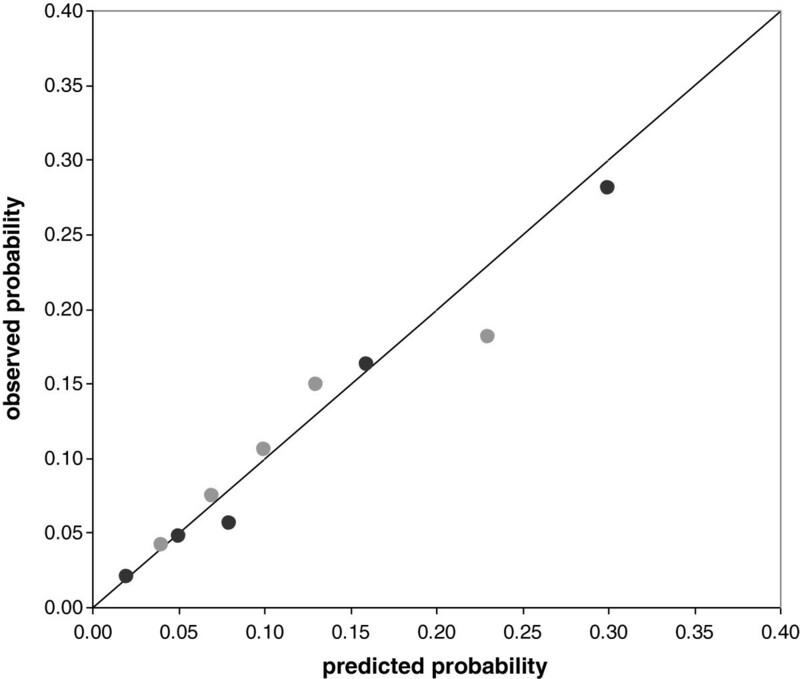 Excluding strong predictors considerably reduces the predictive ability of prediction models. Thus, if available, SRH should be included in the SA episodes model, because SRH is a health measure and SA is, at least partly, a health-related phenomenon. The discriminative ability of both prediction models degraded in the population of office workers, although the SA episodes model still showed fair performance. Furthermore, the cut-off probabilities of the SA episodes model confirm those of the development setting. At a cut-off risk of high SA of 10%, the sensitivity was acceptable, but the specificity was low due to high false-positive rates. A sensitive cut-off point can be used to identify as much office workers at risk of high SA as possible. For example, workers with high SA episodes may suffer chronic recurrent conditions that are not yet diagnosed or treated. From a societal perspective, it may be desirable to select workers with a ≥10% probability of high SA episodes for further diagnosis and treatment to prevent worsening of chronic conditions, long-term SA and subsequent disability pensioning. Alternatively, more specific cut-off points can be used to reduce false-positive rates, for instance to select high-risk office workers for costly interventions. Why did the prognostic performance degrade? The purpose of a prediction model is to provide valid predictions for new subjects [24–26]. External validation refers to the transportability of a prediction model to other settings than where the model was developed [18, 30]. Prediction models tend to perform better in the subjects used to develop the model than in other subjects, a phenomenon known as over-optimism . For internal model validation, bootstrapping methods are recommended to provide bias-corrected estimates of model performance. In the development sample of health care workers, internal validation by bootstrapping revealed an over-optimism of 0.06 for the SA days model and 0.03 for the SA episodes model. Subsequently, the performance parameters were shrunken to adjust for this over-optimism [24–26, 28]. Although adjustment for over-optimism by bootstrap techniques may not be sufficient in relatively small data sets , this low over-optimism made it unlikely that the poorer performance of the prediction models in the sample of office workers was due to overfitting to the development sample. Alternatively, underfitting occurs when important predictors are missing from the prediction models. Internal validation by bootstrapping techniques will not detect underfitting because the bootstrap samples are drawn from the same population. The poorer performance of the prediction models in the present study may well be explained by underfitting, in particular because the Nagelkerke pseudo R2 values were lower than in the development sample of health care workers. The Nagelkerke’s pseudo R2 reflects the variance in high SA between office workers that is explained by the covariates fitted in the prediction models . Low Nagelkerke’s pseudo R2 values indicate that other factors than those included in the model may be important for predicting high SA among office workers. Hence, future studies should further update the prediction models with other predictors, e.g. work variables and personal characteristics, provided that these variables are readily available or easy to obtain by physicians. Another explanation for the lower performance may be the different case-mix in the population of office workers. Case-mix refers to the distribution of known and unknown predictors of SA in the studied populations. The population in which the prediction models were developed consisted of 535 health care workers, predominantly female nurses who were younger than the office workers in the present study. One-third of the development population of health care workers reported excellent health as compared to a quarter of the present population of office workers. Furthermore, 8% of healthcare workers reported less than good health as compared to 18% of office workers. The distribution of prior SA did not differ between the development and the validation populations. Finally, the regression coefficients may really differ between the two working populations i.e., the working populations were not plausibly related. The prediction models were developed in health care workers, predominantly working in physically and emotionally demanding nursing care. Possibly, this development sample differed too much from the current validation sample of office workers performing mentally demanding work at an insurance company. Furthermore, the ‘healthy worker effect’, which selects the healthiest employees to work until older age, may be greater in nursing care which is more physically demanding than office work. This may explain why the inverse association between age and high SA was stronger in the development sample of health care workers than in the validation sample of office workers. The ‘healthy worker effect’ may also explain why SRH was a stronger predictor of high SA in health care workers than in office workers, particularly since SRH was found to reflect physical functioning rather than mental health . Prediction models have practical perspectives if they accurately predict outcomes for different populations [18, 30]. This study showed that the SA episodes model accurately predicted the risk of high SA episodes in both health care workers and office workers. Therefore, this prediction model may be a promising tool to select employees at risk of high SA episodes for preventive occupational health consultations. Such consultations were found to reduce SA duration [7, 8], but not SA frequency . Duijts et al. reported that in employees who received preventive coaching the mean SA duration was 11.7 days during 8 – 12 months follow-up as compared to 13.1 days in the control group. The mean SA frequencies were 1.07 and 1.40 respectively, though none of the differences in SA measures was statistically significant . In the current study, the SA episodes model identified employees at risk of a high SA frequency, but the model may also indirectly identify employees at risk of future long SA duration, because frequent SA has been recognized as a risk factor for long-term SA [35–37]. Further research is needed to clarify which frequent absentees develop long-term SA in the future. It is also important to further validate the SA episodes model, for example in large heterogeneous populations and in multiple settings [18, 20]. The more numerous and diverse the settings in which the SA episodes model accurately predicts high SA, the more likely it will generalize to untested working populations . Furthermore, the SA episodes model should be developed into a nomogram or score chart that is easier to understand and use in daily practice than the regression formula. Simpler presentation formats provide approximate predictions, but this will not be problematic for identifying employees at risk of high SA. Although the SA days model showed acceptable calibration, it poorly discriminated office workers with high SA from those without high SA. The SA days model was probably underfitted and needs updating by adding predictors of SA duration. The SA episodes model accurately predicted the risk of high SA among office workers, but needs further multisite validation and requires a simpler presentation format before it can be used to select high-risk employees for interventions to prevent or reduce frequent SA. CAMR conceived and designed the study, retrieved, analyzed, and interpreted the data, and drafted the manuscript. UB interpreted the data and drafted the manuscript. WvR, JJLvdK and JWRT revised the manuscript critically for its intellectual content. MWH analyzed and interpreted the data. All authors have read and approved the final version of the manuscript.